Blue shoots to score in goal, must be over halfway before shooting. As soon as ball leaves field, the whilte player looks to counter to goal. Blue tries to regain possession and score again. Game is continuous. Play a first to ten goal game. Blue (A) dribbles the ball and stops it in front of Red (C). A. must touch the post before then joining the game. Two red players (C and D) look to attack and score in small goal. B defends and looks to delay attack until A gets back to help. Blue team are looking to win ball and counter to big goal. Play until a goal is scored or ball goes out of bounds. 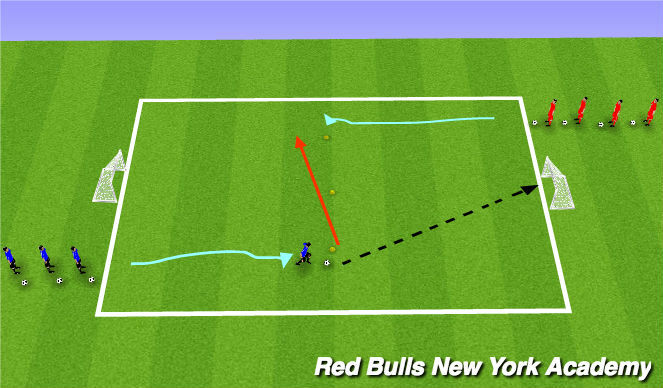 - Transition to attack if ball is won. Swicth attackers and defenders every 2 minutes. Play 3 rounds each, most goals wins. 3 attackers start at one end of the channel, 3 defenders start at opposite end. Coach with pile of soccer balls at goal. Coach plays ball out to any one of the 3 attackers. Attackers looking to beat defenders and score. 1 point per goal. Defenders looking to stop attack. 1 point if they win ball and play back to coach. 2 points if they win ball and dribble out of their attacking end of their channel. Attackers/defenders must stay in their respective channels, only the ball can move between channels. Close down and reduce speed. Try to force one way. Picking moment to win ball. Intro - switching roles between 1st and 2nd defender. End product - options once defense has gained possession. Players and ball can move between channels (only one attacker allowed per channel).